Walk to El Paseo! Quiet Gated Community! 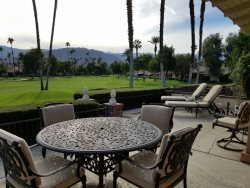 The private community of Montecito is one of Palm Desert’s best kept secrets! Montecito is comprised of two clusters of sixteen condos, each surrounding pools, hot tubs and lush greenbelts beautifully landscaped. Located within easy walking distance of the shops and restaurants of El Paseo, Montecito is a perfect spot for your desert vacation. This spacious two bedroom, two bath condominium offers approximately 1,400 sq. ft. of living space. The sunny great room features wall to wall windows and a sliding glass door that leads to the east facing patio and views of the gorgeous landscaping … and you are just steps to the sparkling pool. The patio is a perfect spot for your morning coffee in the sun or an evening BBQ. Furnished with dining for four and comfortable seating for entertaining. The great room has been furnished with a large sectional sofa, desk, large flat screen cable TV, stereo and contemporary and tropical décor. The dining area seats four and the kitchen has been fully updated with custom cabinets, granite countertops and new appliances and supplies. Everything you will need for family meals and entertaining guests. The contemporary master suite has been furnished with a king size bed, vanity and flat screen cable TV. The master bedroom also features wall to wall windows and sliding glass doors that step out to the back patio. The master bedroom also has a private on-suite. The guest bedroom is located at the opposite end of the condo, offering perfect privacy between the two bedrooms. Appointed with tropical décor and furnished with a queen bed, this bedroom also features a sliding glass door that steps out to a small private patio with seating. The guest bathroom is located just outside the guest bedroom and has a tub/shower combination. The entry courtyard is gated and has a small sitting area. Leaving the front door open and the back patio slider, guests can let in fresh air and enjoy the wonderful cross-breeze! This condo also offers cable TV, DVD player with Netflix access, Bose stereo, Wi-Fi and free US and Canada calling. There is a shared garage space for one car with use of garage door remote and ample community parking spaces for guests. This is a beautiful condo in a unique, quite area, yet in close walking distance to one of the most desirable entertainment venues in the desert. The condo is comfortable, squeaky clean, well maintained and the owners have taken great care in furnishing and supplying all the amenities their guests will need for a wonderful seasonal vacation. Please note that this community is regulated to a minimum of one month stays. Also, the community pool is heated to 86 degrees the week of and the week after Thanksgiving, and the months of February, March and April. Pool heat is turned off all other times. No pets or smoking please.